Copernicus’ treatise On the Revolutions of the Celestial Spheres marks the beginning of modern astronomy. 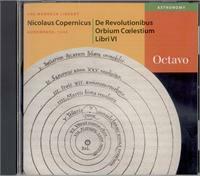 It inaugurated the “Copernican Revolution” and inspired Kepler, Galileo, and Newton by placing the sun at the center of what could now only be called the “solar system.” Indeed, it was only the advocacy of Copernicus’ work by Kepler and Galileo that inspired the belated prohibition of this book in 1616 by the Catholic Church. De Revolutionibus was a revolutionary new blueprint for the planetary system, in which the earth no longer rested solidly in the center of the cosmos but spun on its axis, revolving around a distant, fixed sun. Copernicus’ arguments seem highly compelling in retrospect, but his cosmology appeared ridiculous to his contemporaries. The first edition of his book probably numbered only 400 to 500 copies; Copernicus, elderly and bedridden, received the completed volume on the day he died.